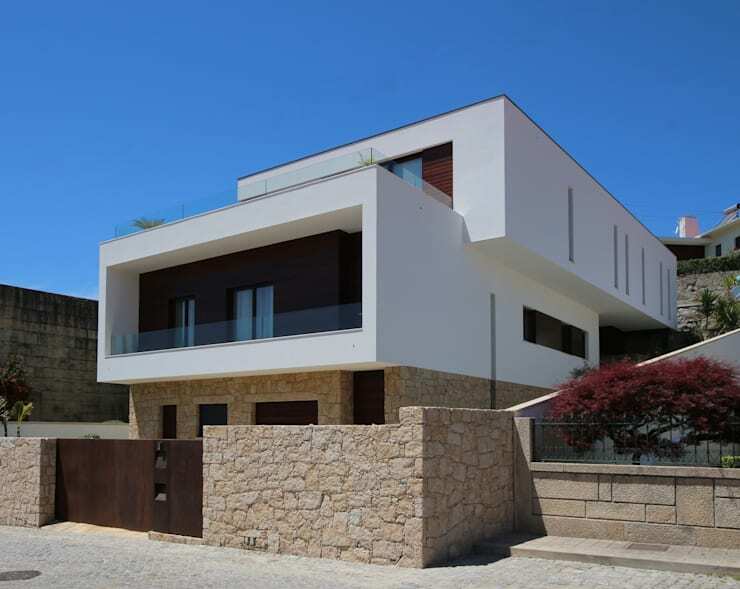 Venturing to Guimarães, Portugal we discover this architectural marvel by the team from 3H_Hugo Igrejas Arquitectos in Matosinhos. The three storey home has been revamped to make it this excellent upgrade on a traditional home with all the modern aspects that make for comfortable living in this day and age. The home is simple yet charming and has that family friendly appeal about it. Inhabitants of this home are privy to priceless panoramic views and modern minimalist style while enjoying sunlight from every angle. Living in this home would be nothing short of living in paradise and who wouldn't want to enjoy beautiful views from the comfort of their own home? Three storey homes are certainly the perfect way to maximise space and create more if land area is limited. The simple yet beautiful exterior of this home has taken the three floors aspect and adapted them to a smart yet functional design, making use of the landscape to its benefit. Natural light and fresh air will flow in adequately and efficiently through this home with the incorporation of large windows at the front and the sides of the structure. The inclusion of dark wood and stone work as a design element on the exterior works really well throughout the building, making it eye catching and elegant in every way. The tiered look of this home is further emphasised through the addition of a balcony at each level. The cube design of this home is contemporary, making use of clean lines and geometry to ensure that it maintains a timeless and different element, while looking inviting and welcoming to guests and inhabitants. It's quite a magnificent and inspirational home, isn't it? The top level of this three storey home includes a well-placed truly blue swimming pool, perfect for a small young family to enjoy on a hot summer's day. The modern architecture of this home is translated into this upper level as well, making this home almost show off its style. 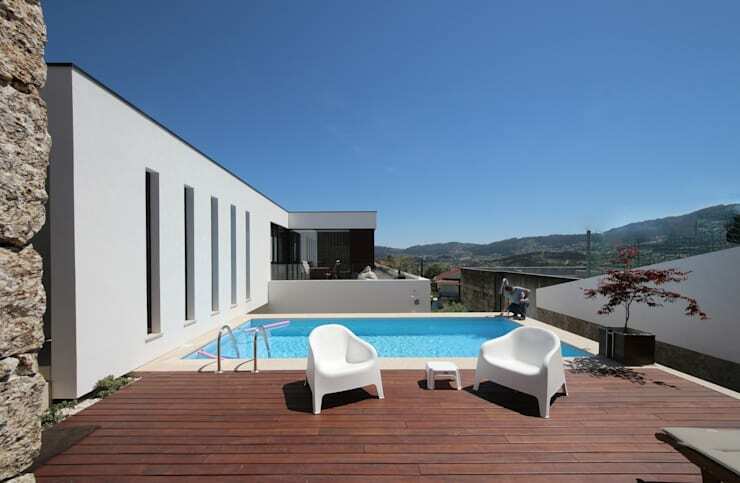 From this top storey of the home, the sunlight can be enjoyed or just reading a good book by the poolside will become a daily activity, then there are the breathtaking views from the Guimarães landscape that can be fully appreciated from this height and clarity. The home is built into a hillside and enjoys entry ways at each storey, making it easy to walk around the outside of this home, perfect as quick way to get from one part of the home to the other on those pool party days when guests are pouring in! Have a look at some more pools ideas here! The indoors of this home is welcoming and inviting and has a sense of warmth and charm, while being modern and minimalist. The use of wooden decor aspects makes the natural effect of the room neutral and relaxing too. The same wooden hue was utilised in the flooring, large pot plants and even TV stand! While the large glass table with white detail adds to that minimalist aspect, making this living room remain uncluttered and simple in its decor and design pieces. The introduction of neutral tones in the luxuriously soft and relaxing sofa blend well with the natural detail including in the room. 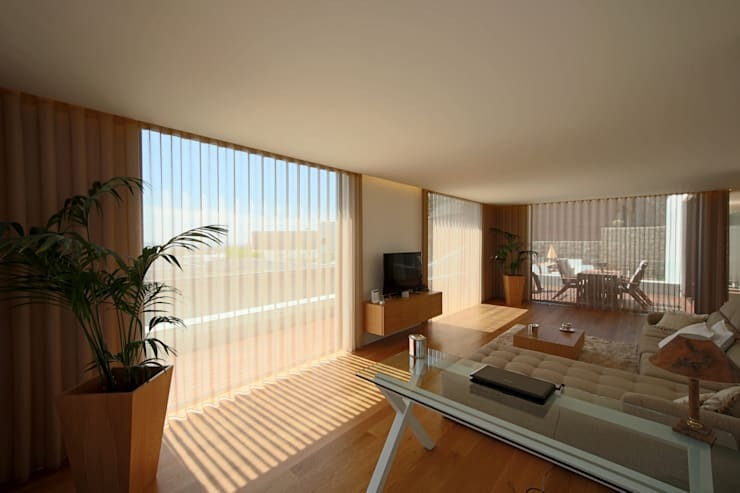 The large windows all around the living room ensure that natural light is prevalent throughout the day, making this room bright and breezy, while the installation of transparent blinds allows for enough privacy while also allowing some natural light to enter into the room. The all-white walls adds to the brightening effect of the room. This dining room is comfortable and an excellent use of space planning and design has gone into making it blend in well with the other aspects of this modern home. Again we see that natural wooden colour being introduced into the room, making it's way through each aspect of the dining room. The natural wood colour has been used in the flooring and dining room table, while the dining room chairs are a darker shade of brown. A simple wooden side table has also been included into the dining room to allow for some storage space and it works well with the design too. Natural light also enters the dining room generously through the large well-lit window that faces the dining room table, making this room warm and inviting. 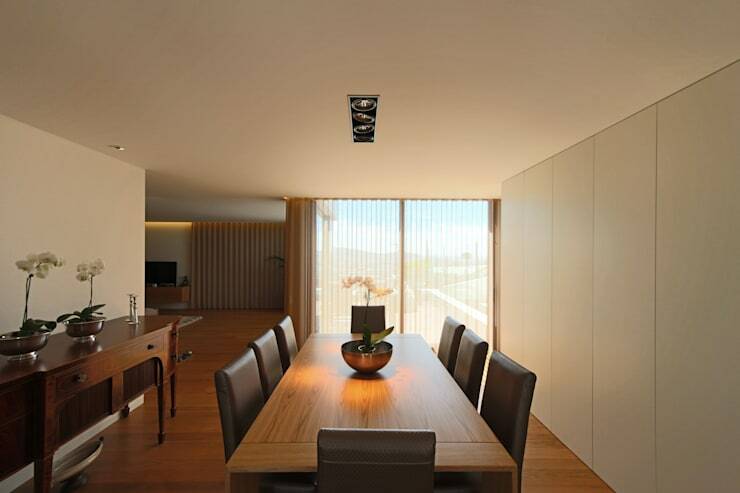 A simple ceiling light has been added just above the dining table for that softer ambience. How fun would it be to host an intimate dinner party here with your closest friends and family? This splendid kitchen is modern and minimalist in every way, it will certainly make anyone want to learn how to cook to make better use of it. 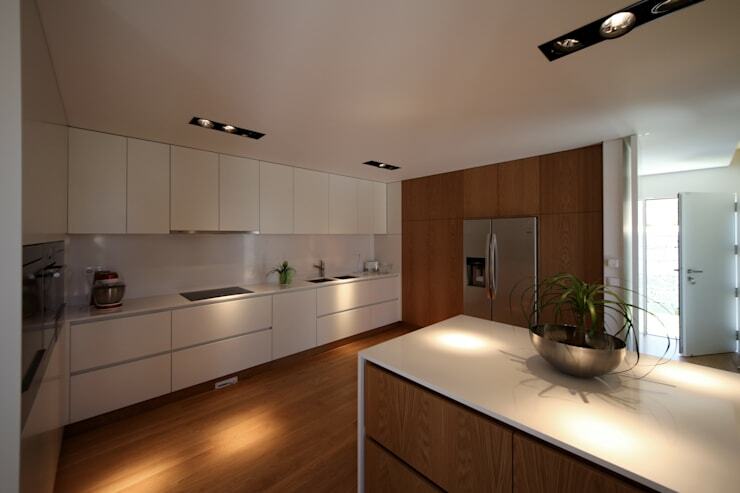 It blends comfort, quality, taste and functionality along with harmonious and strategic lighting to make for a perfect cooking area. The wooden aspect was brought into the kitchen as well through the addition of the natural flooring colour and ample storage space situated in the kitchen island. The double door refrigerator has also been built into wooden cabinets of the same tone as the flooring. The minimalist look was further translated into the all-white wall of the kitchen, with simple, elegant storage spaces and seamless white ceiling. The white counter tops make this kitchen look clean, reflect more light for a brighter effect, making it seem more spacious as it integrates with the wooden element. This kitchen is perfectly suited for the interior of this home. This comfortable all-white bedroom decor looks almost invisible as it blends in with the white wall and built-in floor to ceiling cabinets, a perfect storage opportunity for smaller bedrooms. This minimalist bedroom decor ensures an uncluttered approach in all aspects of the bedroom. We see the introduction of that same natural wooden flooring carried through into this bedroom, with a small bedside table included in the same wooden material next to the bed. While all other parts of this bedroom remain completely white, the embroidered bed linen and scatter pillows add a touch of charm to the bright bedroom. Taking the modern feeling of this bedroom a step further is the incorporation of a simple light fixture in a groove above the bed. 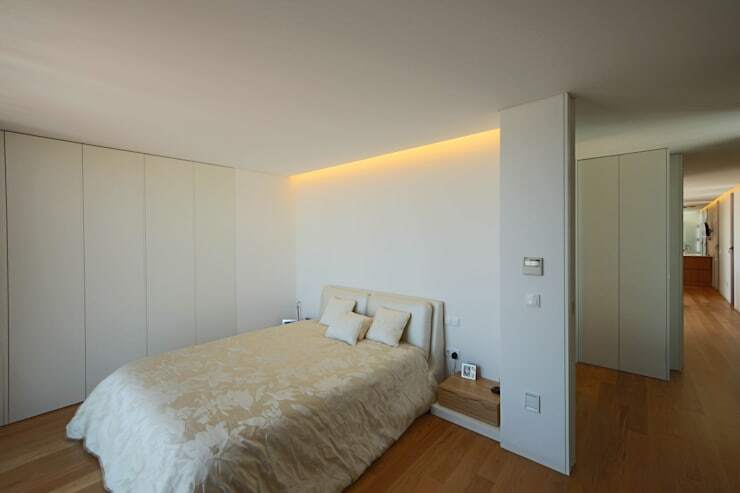 Ensuring that even the lighting part of this contemporary bedroom is simple and uncluttered. There is complete synergy in all rooms and parts of this home interior, surely making it a homely environment. The magic of this three storey home is captured completely on the terrace on a breezy evening enjoying the spectacular view of the Guimarães landscape while taking in the abundant fresh air on the top level of this magnificent house. The cool blue swimming pool just looking so inviting and welcoming or just lounging on the deck while enjoying the night air. The modern style of the home with its long rectangular windows surely makes for a different fabulous appeal and is simple and elegant, while being eye-catching to passers-by. The neutral tones and elements such as wood and stone give this house an environmentally friendly look. Think of all the fun parties, events that can be enjoyed at this terrace and the memories that can be made with family and friends in this swimming pool. Who wouldn't want to be inspired to have a home just like it or quite similar? What do you think about this three storey home?